Constructed with panel elastic and soft cotton type lining for patient comfort. Is the Panel Elastic Binder right for me? Ideal for post-natal or post-abdominal surgery, abdominal strains and weakness to provide compression and support for day-to-day movement. Try our Brace Advisor for personalized product recommendations to meet your needs! Constructed with panel elastic and soft cotton type lining for patient comfort. Universal style, flannel lined panel elastic support with contact closure. Multi-panel design helps prevent panel rolling. 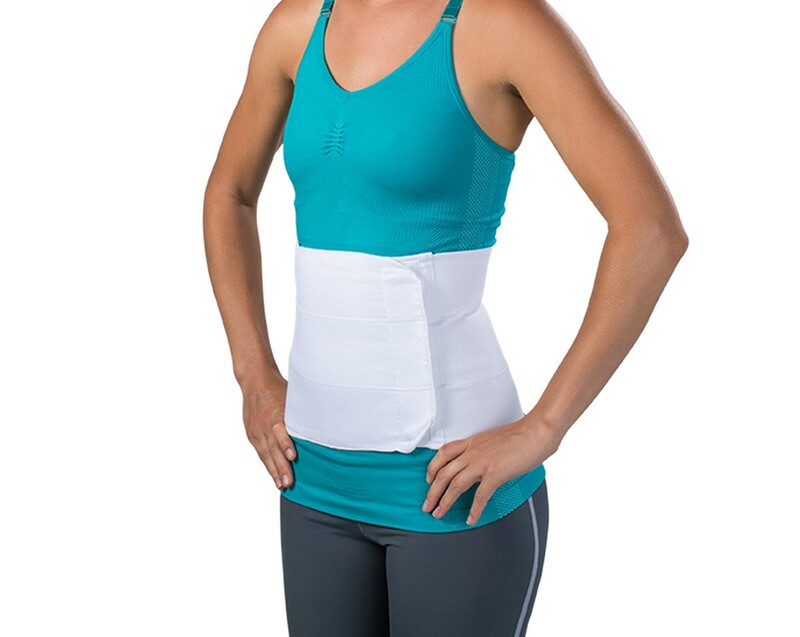 Ideal for providing compression and support for post-natal or post-abdominal surgery, abdominal strains and weakness. Available in each or as a 6 pack. 9" or 12" height. The Premium Panel Elastic Binder is our tallest option and based on your waist measurement you would want to order 12" 4 panel Universal size 45-62". You will order the 12" panel Universal 45"-62"
Buy more! Save more! You can now save as much as 15% or more by ordering multiple quantities of the same product (this includes left or right and different sizes of the same product). This is a great way to save for those who are purchasing for teams or large groups. For larger quantities of the same product, please contact Service@BetterBraces.com. I need lumbar support for my back I have disc problems, my waist is exactly 36 inches what size would you suggest that can give me firm support, I will be using it almost all day under my clothes. Hi, I am looking for a perfect fit to wear after I give birth. I want to fit all the way from under my breast to my lower abdomen. I am 5'8", do you have this with a longer height, longer than 12"? My torzo is already 13" without the belly. The binders tallest size is 12"
I am 2 weeks post partum with a painful umbilical hernia and lower back pain from breastfeeding/carrying baby. Is this the best choice for me? Yes the Premium Panel elastic Binder is the product that will help the most with all of the issues you are having. I had a c section 4 weeks ago, I need that to cover my belly from under my breast to under my c section. My height Is 5'2 and wait 160 pounds. I don't know what size to choose and I don't understand the difference between the ones that say universal 6pk. You can purchase one in the Universal size or you can purchase the 6pk which will give you six binders in that Universal size. As far as which one to order, measure the distance between your breasts and the Area that you want to cover to decide if you need a 9" or 12" panel. Then you only need your waist circumference to get the correct size. Im looking for a post partum binder , i dont know if i need the 9" or 12" i want to be fully covered on the belly part, starting above breasts. Hi, just had a lumbar fusion and disc replacement last September. Dr gave me a 4 panel DJ Orthpedic LLC Universal binder 62"-74" at the hospital. I still sometimes use it, but it is now worn out and will not grip anymore. I'm looking to purchase another one, but the largest part of my belly/waist is 55". Which size should I buy? Thank you in advance. You want the 12" 4 panel XL which will fit 62" to 74"
I broke 11 ribs 2 years ago. breathing deep is paionfull. will this rap go up under my arms to brace my ribs. its been 2 yrs there healed what do you suggest??? I couldn't see the back, this doesn't have that bone in it does it? I just want a simple binder like the one I got at the hospital. I bought one with the bone but it was so uncomfortable. On the picture it shows a three panel one, I'm assuming if it gets larger it gets longer around, which makes it four panels. I think I want the 12". So, if I understand it, the one on the picture is three panels and four panels on the 12". I will wait for answer before I order. I'm hoping it doesn't have bone on the back. Thank you. No these do not have the stays in them and yes the four panel is 12"
Hello Im looking a girdle dj orthopedics, LLC Universal 30" -45" or similar because my waist size is 45"-62" and I need it from under bust to full hip ..which one could be better for me ? I'm looking a girdle dj orthopedics, LLC Universal 30" -45"
My mom has an older model ProCare 79-89045 Sac LUmb\ABD support medium, lot 032607. Can you tell me if there is anything similar in current inventory? I am looking for a brace for pain management for a compression fracture at T12. What do you suggest? One of our LSO braces with a chairback will cover the T 12 area. What size panel wise is the photo? The 12"? THat is the 9 inch binder in the picture. Hi, just had an abdominal hysterectomy. Dr gave me a DJOrthpedic LLC Universal binder at the hospital. I'm looking to purchase another one. Can you tell me if your product is LATEX FREE?? I am looking for a 15" multiple panel binder in the size 45-62" range. But everyone I am finding only comes 62 & above in size range. Is it possible to find a binder in the 45-62" range? I have a hernia near my navel & am trying to lose weight to be able to have surgery to rebuild my abdominal wall from stem to stern as I have a weak wall & this site has been repaired more than once, but it continues to pop out again. The Dr. has recommended a wider binder, so I have went to 12 inch, but feel that a 15" would be better suited for my needs. How do I know if I need a 9' or 12'? Also how i measure for size? The height could depend on your height and torso size or if could be determined by where you need the support and compression. When looking at the item, prior to adding the item to your cart you can click on the size chart to the right. To get the correct sizing you will need to measure you waist. Thank you for your question and for contacting DJO. A great corset for postpartum. The material is super soft (and washable)! I think my favorite part is how I easily I could cinch the binder as my belly shrank. I got the 9" and it fit great and I'm 5'7". Although, I probably could have gotten away if the 12 inch. I definitely recommend people give this a try before spending $100+ on the corsets that do the exact same thing, but just look a little bit fancier. This binder has been a lifesaver for my husband who has a very bad back and would not be able to stand if it was not for this binder. I also told a friend about it and I purchased one for her. She also is very pleased. I had a c-section and I got my first brace in the hospital. Not wide enough, yet way too long. The velcro destroys the fabric it is sticking to. So to remove and refit left velcro sticking to damaged fabric. Binder is easy to use due to Velcro closure. Recommend for after stomach surgery. Pros: Reasonable cost for product. Fast shipping & delivery. Cons: Ordered 9"...should have ordered 12" so edges don't roll over. excellent! I love the braces! Cons: on occassion, the velcro scratches my skin a bit, if its not aligned, properly. Stays in place does not move around like 6 inch binder. Great product does what it is intended to do.